Rainier's Got Great News for ALL Big Dish Owners! It's great you guys keep adding channels. Soon you will surpass the number the 4DTV had at the end. Its looking very promising for c band again. Anyone on the fence you need to take a good long look at Rainier. They definitely are dedicated in achieving their goal of bringing c band back! The 4DTV had approx 38 channels with HITS prior to shutdown. Rainier currently has 30 channels. Were expecting to add about 10 more very soon with Variety's launch. We are looking at adding up to 50 channels or more in 2019 as we continue negotiations with the programmers. We also are waiting on delivery of the new Mighty Mini movers from the factory. We needed to get new movers in place with the projected growth with launching the new networks. The Mighty Mini's will be able to fill the void left with the end of production of the AP-600. We are dedicated to bringing the best back to the big dish. My wife recently found out from a friend that the Hallmark channel has 22 new Christmas movies this year. You mentioned expecting to add 10 more channels very soon. Hopefully for my wife Hallmark will be one of those. Myself, I'm more interested in old classic movies and would love to see AMC or something similar added. Any chance of these channels happening? WOW! Up to 50 more channels or more in 2019. With that many additional channels should I assume that there will be some premium cable channels like History or DIY or the Food channel for the wife? BTW: That's really great that Rainier got a premium movie channel. VIVA RAINIER!!!!!! It's great to be a Rainier customer. For years all we heard from the programming center and Skyvision was bad news, channels are leaving on ....date. Never hear that from Rainier. It's all good news, were adding more channels! . If you own a bud and don't have the 9865 receiver and a subscription to Rainier you're really missing out on the best kept secret out there. Keep up the good work Rainier. We definitely appreciate it. One may ask why Rainier don't post all the channels names and networks we are in negotiation with? This is due to the NDA's we have in place. We must abide by the rules. Soon as the rules in a specific NDA allows us to make a formal announcement we do. This may seem frustrating to the consumer waiting for announcements. But the rules are rules. Channels do continue to leave c band but these are the FTA variety. Stations such as AMI, the 4 KRBK networks, ION and others have left lately, the FTA loss of channels continues. Not good news for folks with FTA boxes. Rainier subscription channels numbers on the other hand has grown and continues to grow. Our D9865H or D9865D receiver is required to subscribe. Were glad we've been able to turn around the old trend that plagued NPS, Skyvision and Programming Center and the 4DTV with loosing channels. C band has only been brought back through the hard work and finances invested by Rainier to make this a reality. We saw the writing on the wall in 2013 when we formed Rainier. Something needed to be done. Others that were still in the satellite business never wanted to invest the time and finances necessary so they went away. Rainer promises to continue to do what is necessary to continue obtaining our goals for c band big dish TV. FTA is a dying cow. The only way to go with the big dish is with Rainier. Thanks for all you guys are doing. Hi I'm new to the forum and want to tell my story. I was a 4DTV subscriber for many years. I was devastated when it got shutdown by Satellite Receivers and Skyvision. When SRL was closing shop they never mentioned Rainier Satellite as an alternative. I talked with Skyvision too with no mention of you guys, although the gentlemen over there wanted to sell me a FTA box claiming its all there was. Luckily with the help of Google I found Rainier, so I gave them a call. They were very nice to me and answered all my questions. I ordered the 4DTV upgrade 9865 receiver and programming package. The receiver and hookup supplies came promptly and was easy to set up. Once it was up and running I got my programming turned on from Rainier. The picture is breathtaking on my 60 inch TV. I've been very happy with my Rainier service. I'm tickled pink that you guys keep bringing back channels to my big dish. Everytime you guys add new channels I feel like its Christmas. 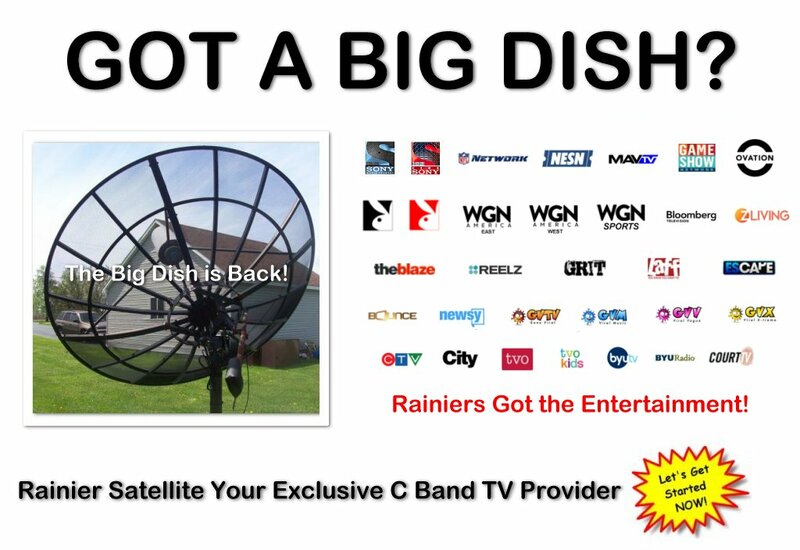 I highly recommend Rainier Satellite to all with a big dish. Its not dead or only some low quality FTA channels. Excellent cable subscription channels can still be received with a Rainier 9865 at a low monthly cost. You can't beat Rainier's products, services and support either. Great company to do business with. Welcome to the forum 4dtvfrank. Great choice going with Rainier. They're really making a difference. I'm not a bit surprised by the lack of information about Rainier from SRL and Skyvision. Every FTA dealer I've spoke with either told me there's no subscription services left, or said bad things about Rainier or their employees. For some stupid reason they fear Rainier bringing back subscription tv to the big dish. Seems they only want folk to buy their FTA garbage products, and lie like crazy to seal the deal. One fta dealer told me you can get most cable channels with fta. What a liar! That seems to be the trend from those guys. To all, don't fall for the lies. If you looking for good products and the cable channels Rainier is the place to go. They won't steer you in the wrong direction. Enjoy your stay 4dtvfrank, nice bunch over here. Rainier gets calls all the time from people who've been given incorrect information from the FTA dealer and their crowd. It's sad that they've chosen to act like this. They don't realize they're only hurting themselves. Patrons treated as such usually don't do repeat business with that company. Rainier conducts business professionally. Our trouble free products and work ethics speak for itself. At Rainier we want you as a satisfied customer today and down the road. The proof were doing it right is when our customers return for upgrades to their system and programming. Rainier has repeat business all the time. At Rainier we value you as a customer and go out of our way to keep you satisfied. If you're tired of the run around from others we welcome you to give Rainier Satellite a try and see the difference. Hallmark and AMC would be great. Last time they were on the big dish was when NPS carried them. Never had those with SRL's X4 service. Rainer keeps bringing the channels back. They've been working on it for a while. It ain't been easy because the little dish and Motorola ran it into the ground. Rainier was smart though. They didn't go with Motorola's system. They went with Cisco's PowerVu which makes up over 75% of the channels cable providers get today. Joints like SRL and Skyvision slapped a temporary band aid fix on the 4DTV using HITS on X4 when the legacy 4DTV stream was shutdown by Motorola in 2010. HITS couldn't provide many of the networks to the outdated 4DTV. They kept losing channels as the DC-2 system was upgraded to MPEG-4. The writing was on the wall for a long time after GI sold the 4DTV system to Motorola. They never upgraded the receiver to do the newer modulations that could've been done with a firmware update. As the story goes Motorola wanted to charge $1.00 a month for the TV guide to cover costs. A bunch of cheapskates got together and filed a class action lawsuit against Motorola because the original 920 literature said the guide was free. They won the case and forced Motorola to cover the costs. After that Motorola let it go to the dogs. Can you blame them? Over a lousy 12 bucks a year the cheapskates sealed the fate. Reminds me of the FTA crowd that believe they're entitled to TV for nothing. And they wonder why FTA is going to the dogs? These bottom feeders don't realize that it costs money to do business and never will. As the bottom feeders search for cheaper and cheaper crap continues they will put the few remaining shady FTA dealers out of business, and that will be bye bye to their 29 cent hobby.